I hope you are all having a great weekend. Yesterday I decided to sit and play with my Cindy Lo Cricut Cartridge. I've had it for a while now and never played with it. I used my Gypsy to layout the design for this card. I love my Gypsy, even more now that they have the hide contour feature....I'm thinking I might ever go ahead and make a birdhouse shaped card too. Beautiful Christina, love that birdhouse, and your new music. The new music surprised me this morning. Love the video, I'm keeping my eye on this cartridge, great card. OHHHHHHHHHHH so VERY VERY cute Christina...I ADORE birds, I have eight parrots of my own ...lol! I love your blog, such great inspiration, thank you for taking time to make the videos too! love the card! Will have to pull out Cindy Lou and start using it. The new music is fun! Thanks for all the great videos that you do, always so enjoyable to watch! 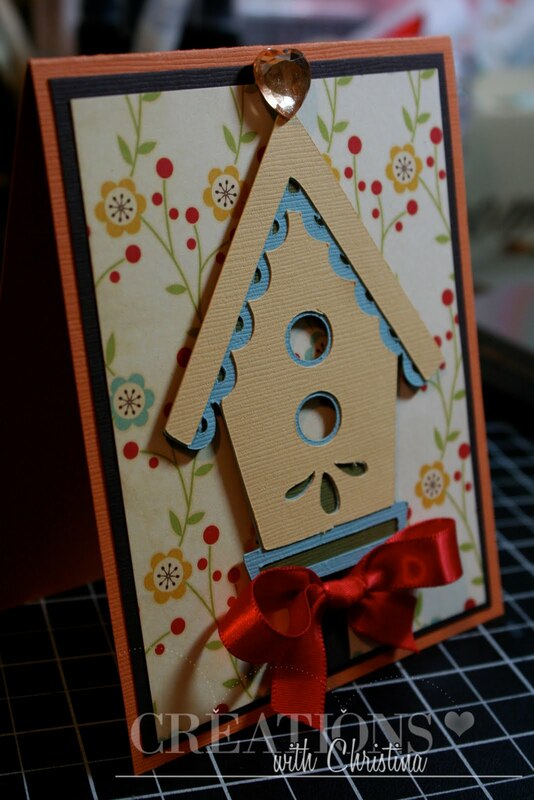 LOve this card, I have a thing for birds and their houses! This is one cartridge I will have to get. Thanks for all your great ideas. What a darling card! I just ordered the Cindy Lo cart and I cannot wait to get it so I can play with it. Cindy Loo is a great cart - glad you made this video! Love the card, and love the new music! (Just a note that the cartridge spelling is Loo not Lo ☺) Looks like I need to get this one, too cute!! Oh so very sweet. I love the bling heart. You always have a nice extra touch to your cards. Christina I love the new music too! Your card is really adorable! Thanks for the video! I noticed the new music right away. I love it! Awww the bird house and choice of papers are so cute. 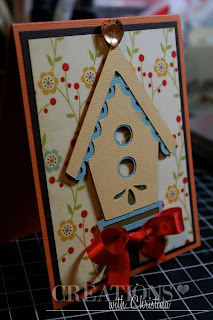 Very nice card and I love the birdhouse. All the paper works well. It would be a great housewarming card. Thanks for sharing. Such a cute card, Christina! Super cute! Love that bird house. GREAT JOB Miss Christina!! I just LOVE it!! What an adorable card - great colors and paper. Christina, I love the lil birdhouse!! Toooo cute!! TFS!! Hi Christina I love this birdhouse. I especially love your color scheme. I like your new music but your other music is the best! !